Computer Tech Support - Who Ya Gonna Call? When your computer starts acting oddly or breaks down entirely, you have a choice. Common problems such as viruses & spyware, lost or damaged files, flaky hard drives or failing power supplies can sometimes be hard to diagnose. 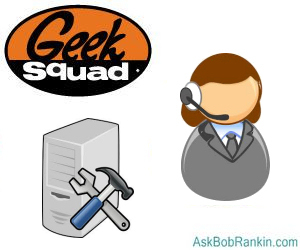 Should you try to fix it yourself, or call a computer tech support service like the Geek Squad? Depending on how adventurous and/or geeky you are, there are several things you can do. If the computer is still under warranty, call the warranty provider. That may be the manufacturer, or a third-party computer tech support company. Be prepared for finger-pointing ("Sounds like a software problem, your warranty covers only our hardware") and long telephone hold times. Try to fix it yourself using software manuals, household tools, and - if you can get online - diagnosis and repair guides that you find via Google. Of course, this website offers a wide range of advice about fixing many common computer problems, but not everyone is a do-it-yourself type. Call your computer-savvy friends and relatives. They may or may not be available, or know what they're doing, or very motivated to spend hours fixing your problem for free. Call a computer repair shop. But what kind of computer repair shop? There's the kind that says, "Bring your computer in and we'll take a look at it" just like a car repair shop. Nationwide computer repair shops, including computer vendors, tell you to "mail it in," which can get rather expensive and time-consuming. (You did save all the original packaging, right? Of course not.) There's also on-site service; a repair person comes to your home or business. Then there's the kind of computer repair shop that never looks at your problem in person; instead, they offer to "talk you through" your own repairs. These guys go by different names, too. Computer help desk services are for when the problem is you. If your computer is fine but you can't figure out how to increase the font size in Microsoft Word, a computer help desk person will tell you over the phone. Such on-demand tutors are also called "computer support" or "computer technical support" services. Large employers have entire departments providing help desk and tech support to employees all day long. Independent computer support services take calls from anyone who can pay. Computer repair rates are comparable to car repair rates, although the cost of parts is generally lower for computers. Some computer repair shops charge a "diagnostic fee" of $50 or so just to figure out what's wrong and tell you how much more the fix will cost. Hourly labor charges for computer repair can run $30 and up. The Geek Squad popularized computer repair services with million-dollar marketing campaigns and logo-emblazoned company vehicles. Today, The Geek Squad offers all the types of computer tech support services discussed above, including some pretty trivial ones. It will cost you $50 to have a Geek Squad member talk you through setting up an email program and address . Troubleshooting email problems starts at $70. Fifty bucks (plus parts) will also get a hard drive, network card, or other hardware component installed if you "bring everything in to a Geek Squad or Best Buy store near you and let us take care of it." On-site service starts at $150. They also offer "24/7 Tech Support" ($199) which gets you unlimited access for one year to online, phone & in-store service for up to 3 computers or tablets. Office supplier Staples offers "Tech Services" computer repair services. A full range of diagnostic and repair services is available in the store, or at your home/office location. Virus Protection ($99.99) inlcludes installation of Internet Security software, and unlimited virus removals for one year. PC Setup ($99.99) includes Windows Update configuration, and installation of up to 3 software titles. Data Recovery ($259.99) provides in-store recovery of lost pictures and documents. If they can't recover your information, there is no charge. Other national companies offer computer repair and computer technical support services, too. AT&T ConnecTech has a $15/month plan that provides unlimited phone and remote desktop help desk services. All of these well-known services will have computer techs trained to handle the most common computer problems, and should do a good job of fixing your computer. If you're outside the USA, and don't know of a local computer repair store, NerdsOnSite.com is an international network of local computer repair techs who make house calls. Most recent comments on "Time to Call The Geek Squad?" Went to Best Buy to see if the GEEK SQUAD could help with my laptop not charging. A friend determined that the power jack probably needs soldering. The in-store associates said they don't do those things there, and they'd have to "send it away." They told me that I'd end up paying more than the price of the laptop, so I left. I saw someone on YouTube offering to do the job for $100 and I'm tempted, but I still haven't gotten it fixed. About 1985 got my 1st, a Compaq, knew nothing about computers except by reading. Got it up and running, Wordstar the same, but after couple of years it would not do anything except error #..... so I contacted Compaq & local vendor but neither could help. I bought an Everest, outgrew its capabilities, went to a SONY. When it stopped a local shop tested power supply for free, sent me to SONY dealer 'cause it was a proprietary part only through dealers. The order got sidetracked & had to be sent to me and I installed it myself. Since then I've done it all myself including installing boards, memory, drives, etc. Did get my niece to replace bad HD with new SSD in laptop - she was head of Geek Squad until BestBuy downsized the store & she went independent. She already had a 2-yr tech school degree and is really good! Geeks are not always inefficient but ask questions if in doubt - anywhere. Still doing my own as a total amateur who can READ, think, try. and I am now posting from my now-functional laptop. Anyone running around in a Geek Squad car is something I stay away from. When I have a problem that I cannot solve I look for local talent online. It seems every town has tech guys that work out of their home. I found a good one 7 minutes away and very reasonable. He repaired two and the price was WAY below what the Geeks charge. Look for and use local talent when you can. I have been repairing computers now for 30 years. Your best bet is at a local,well established shop.These tend to keep well versed techs and with a LOW employee turnover rate! I have done Contract repairs when I was dispatched to Rescue what Geek Squad and other nefarious "Repair Techs" have misdiagnosed, screwed up or Intentionally Inflated the costs for Profit. ALL you will get from 800# repair services is hit or miss AT BEST! DON'T USE THEM! I used The Geek Squad to help me with a minor computer problem. I was chatting with the person helping me and I asked them what type of education they needed to be Geek techs. The tech. told me that they did not need any type of education or degree at all. They just had to take a test and if they passed, they would be considered for employment. I was very surprised about this. They were able to fix my problem by coming into my computer remotely but my problem was minor. I wonder how much they could have actually done, if the problem were more involved? I hope I never have to find out. I'm a member of Geek Squad since last September and so far I'm pleased w/their performance in repairing my Computer I was w/Staples and frankly I wouldn't recommend them to no one they just don't know what the heck they're doing. But when I was told to go to Best Buy they (Best Buy) introduced me to GEEK SQUAD and I'm happy they did, a friend also cousin of mine and my niece are impressed w/Geek Squad so if anyone needs help w/your computer I would advise going to Geek Squad and their not expensive whatsoever, not like Staple their too costly. I use Data Doctors and have been very happy with them when I needed my Dell fixed. They also have an I-Fix-It sub-contractor in my local Data Doctors store that works on things like tablets and phones. Used them to put a new plug-in port on my Samsung Galaxy 4 phone for $40 in about 10 minutes while I waited. Saved me having to buy a new phone for $500+. Bob, Thanks much for addressing this issue. I have had the 24/7 Geek Squad protection plan for about five years. It does originally cost $199; but, after the first year, renewals cost $99. I live in a small town in MS, and there is no one available to work on my computer, so the Geek Squad agents have been a big help. They will remotely connect to fix the problem, but I have also had them come to my house if the problem cannot be resolved by the remote connection. Since i have the protection plan, I am charged $50 for an in-home visit. So far, the Geeks have been able to deal with all of my problems, although sometimes it takes more than one agent to get the job done. Agreed, if I lived closer to good computer help, I might give them a try; but, for now, the Geek Squad is my go-to repair shop. I bought Geek Squad protection with my new computer a year ago. (2016). I used their service enough to make it worth the money. Anytime things started to run sluggish I called for a tune up. Well worth the money. I renewed it for another year. I agree with trying local computer repair shops if you have one. We have a great one in a nearby town. They only charge $35 to diagnose and if you have them fix the problem, the $35 goes toward the cost. Prices are reasonable and they are honest. They don't try to make extra money by telling you that you need things that aren't necessary. Carmen - If your laptop is not charging, it could be a defective power adapter. They DO fail. Try to find someone who has a similar laptop and borrow their charger. If that is what's wrong, lots of eBay sellers offer aftermarket adapters for less than $20 shipped. I want to put in a word for the ZT brand of computers, which gives a lifetime guarantee of free 24/7 support. It's unmashed my potatoes several times a year by talking me through a repair. Once when that didn't work, the tech in India put me in touch with a higher level, in New Jersey, and whatever got screwed up was reversed. Never heard of ZT? Neither did I until after I came across a deal at Walmart.com that offered the computer of my dreams -- 32G RAM, 2TB drive, Intel i7 chip -- for about half of what I'd pay elsewhere. Along with the computer came information about ZT, which I gathered sold mainly to companies. A friend uses Supportrix which has fixed prices based on how many months of service you want from them. I have used them and they helped with my needs at the time. Their contact number is 1-877-787-8749. I believe they are based in India. I now use a local San Diego service run by Mark Stevenson, Point Loma Computer Consultants. The web site is http://www.myplcc.com. He will remotely take over my computer and communicate with me by phone. He charges by the hour/half hour. my solution was to replace my Acer laptop with a chromebook. In the last five years or so I have never had a failure. It helps to have access to a second PC, so you can so you can do online research while working on the non-working PC. Type a BRIEF description of your issue into a search engine. Do some reading. Try some of the suggestions. If the ill PC boots, then you can run a variety of A/V and anti-malware programs. Malwarebytes is good, and so is Superantispyware. There are several good FREE A/V programs, including Avast, AVG, Avira, and Panda; are a few reliable names. You can even use Windows Defender, but it has a weak reputation in the online world. The automatic update usually does not work on FREE programs, so it's on YOU to update at least once every week. If your PC is making odd noises, look for simple things first . . . maybe a stuck or broken fan? Maybe a failing hard drive? I volunteer at the local Seniors Center; and as an oldster, I find it alarming how gullible some people can be. A stranger calls and tells you your PC is infected, and if you give him some information he will fix everything. Nope. Nope. Nope. I learn much from reading these Comment Posts. I have had PCs since 1991, did most of my own repairs & fixes, of hardware & software. But sometimes I am stymied with a problem I cannot correct. I use them for graphics. I now use a powerful Laptop (w/a disk drive & ports) & a large external monitor & wireless mouse & keyboard. An external disk drive & hard drive helps much. And two scanners & two printers. All wireless. Laptops (LT) have prevented some of my fixing abilities. Don't try to fix inside, except adding RAM. They are labor intensive, so be nice to them. 1. I have a Heat & Fan sensor on my desktop (PC Health Monitor). Tells me if LT is overheating. I blow out the dust thru the vents, sometimes I take the back off. Overheating is totally destructive. 2. I use local repair shops that I have learned to trust, I bring the LT in for a diagnoses. They can also do online repairs. If a new shop says to leave it, I walk. Do not leave it, do not ship it. Every PC is repairable in a shop or home or online. Or if cheap, toss. 3. System Restore! Great. but first try rebooting. 4. Do not click inside a open email (or anywhere) link. Open a email to read is usually OK.
5. I use PC Pitstop for a diagnose scan, for probably nearly 20-years or so. Tells me of problems, but they do not fix them. 6. Stay away from p**n or Pharmacy sites. 7. I have purchased additional extended warrentees for my LTs & printer/scanners, they have saved me more money than they have cost me. 8. Buy using a good credit card. The perks include extended warrentees & protections & if something is wrong with the product they usually get my money back & resolve the issue in my favor. Vendors usually don't fight the cards. 9. Have a back-up (older but still good) PC loaded with your essentials & if needed, your back-up drives will reload your items. If my main PC is down, I have the other. At this moment I have in reserve, ready to fire up, an old Desktop, an old LT, & a new cheap small LT that I use on trips along with my ext drives & thumb drives. 10. Read Bob Rankin's news letters to keep up to date. 11. Most of my products that I have owned are from Office Depot/Max. All were bargains. Like a $1600 LT for $600, last on the shelf. Came with full warrentee. 12. I only shop from brick & mortar stores, never on-line. Except for small hard-to-get items. If you like waiting for a new PC, unpacking then, packing it up, lugging it to a shipper, waiting for the return, resending, etc, then buy on-line. 13. I use Norton 360 Virus Program, cost more but not giving Putin my money or Info. For those with Macintosh computers, Apple has a chat feature that has helped me several times. I log in on an iPad and they tell me what to do on my iMac to resolve the issue.